Take your shoes off. Put your feet up. Relax. Your home is one of, if not your largest investments. Not all homeowners insurance policies are created equal. Insurance companies can be as different as day and night. While some companies prefer to insure the house on the hill with 200 acres. Other insurance companies prefer protecting something a little more modest. Here are some topics to consider when reviewing your policy. What if I don’t live in Platte City? Good question…you don’t have to live in or near Platte City for this information to apply to you. The content herein was created with Missouri residents in mind. Most of the topics are broad enough to connect with homeowners across the country. Day 001: Replacement Cost vs Actual Cash Value: Which is Better? Day 002: Does My Homeowners Insurance Cover Earthquake Damage? Day 007: Does My Homeowners Insurance Cover Personal Liability? Day 008: Why Did My Home Insurance Premium Go Up? Day 009: Is My College Kid Covered By My Homeowners Insurance? Day 010: What is Other Structures Insurance Coverage? Day 011: Does My Homeowners Insurance Cover Flooding? Day 012: What is Water Backup and Sump Pump Overflow Coverage? Day 015: What Happens if a Tree Falls on my House? Day 016: Personal Injury: Do I Need It? Day 017: What Happens When You Can’t Come Home? 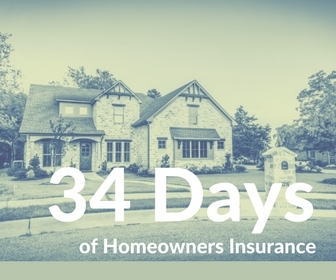 Day 019: Can You Change Homeowners Insurance in Escrow? Day 024: Is Debris Removal Covered? Day 025: Is My Golf Cart Covered by Homeowners Insurance? Day 026: Who is an Insured? Day 029: Do I Need Ordinance or Law Coverage? Day 030: What is Extended Replacement Cost? Day 032: Does My Homeowners Insurance Cover Spoiled Food? Do you have a question of your own? Are you ready to make a change? Head over here to give us a call or send us a message. When not working, you can catch Brandon running, biking, or watching Cardinals baseball with his wife. So You Want to Become an Airbnb Host?